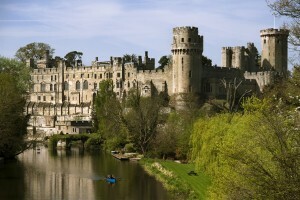 Warwick Castle is set to offer a unique opportunity for guests to step back in time this year, with the introduction of Medieval-style overnight stays in their new woodland lodges. A new Knights’ Village is being created, enabling people to sleep in 28 timber-style lodges on the 64 acre wooded estate. The lodges will feature Medieval-themed light fittings, door handles and crockery, lofty ceilings, wooden beams, stonework and green oak wood styled exteriors to create an enchanting ambiance. From July, the new attraction will offer year-round ‘great outdoors sleepovers with contemporary comfort including wet room, TV, fridge, coffee maker and central heating.